Curtis Perry Ward was born in Kentucky and arrived in Hawaiʻi in 1853, when whaling in the Pacific was at its peak. Curtis worked at the Royal Custom House, which monitored commercial activity at Honolulu Harbor for the kingdom. Victoria Robinson was born in Nuʻuanu in 1846, the daughter of English shipbuilder, James Robinson and his wife Rebecca, a woman of Hawaiian ancestry whose chiefly lineage had roots in Kaʻū, Hilo and Honokōwai, Maui. Curtis and Victoria married in 1865 and for many years they made their home near Honolulu Harbor on property presently occupied by the Davies Pacific Center. “The site of ‘Old Plantation’ once was known as ‘Little Kentucky.’” (Courier-Journal, August 6, 1963) Old Plantation became one of the showplaces of Honolulu and remained substantially unchanged for nearly 80 years. Victoria Ward established Victoria Ward Ltd. in 1930 to manage the family’s property, primarily the remaining 65-acres of Old Plantation, now part of the core of Kakaʻako real estate adjoining downtown Honolulu. Victoria Ward died April 11, 1935. Apparently, so said the plaque outside what was initially referred to as the War Memorial Municipal Auditorium; its name was changed a few times. And, the plaque is now missing – and apparently, so is the memory and original intent of the complex as a War Memorial. In 1955, the Territorial Legislature passed Act 145 authorizing $3-million in bonds for the City and County to construct a War Memorial Municipal Auditorium. Then Congress stepped in to approve the State’s bond proposal. By then, the idea was for the auditorium to honor those from Hawai‘i who served and sacrificed in WWII and Korea. Finally, on July 11, 1956, the Senate and House of Representatives of the US Congress enacted Public Law 694 and approving the bond in the Territory’s Act 145, giving the City and County of Honolulu the authority to move forward. The site was the former ‘Old Plantation’ of the Ward Estate. However, over the years, the memorial plaque has been lost and the Neal S Blaisdell Center’s intended purpose as a war memorial has been forgotten. Through persistence of Tanya Harrison and other volunteers at the Neal S Blaisdell Center War Memorial Project, Honolulu’s war memorial is no longer forgotten. “… as such plans are discussed, the public should be reminded of the Neal S. Blaisdell Center’s heritage as a war memorial and its original purpose to honor Hawaii’s fallen heroes”. They sought rededication of the Blaisdell Center as a War Memorial. “… such as the Waikiki War Memorial Natatorium, Kauai War Memorial Convention Hall, Kauai Veterans Memorial Hospital, Maui’s War Memorial Stadium Complex and Hilo’s Kalākaua Park War Memorial Pond”. They asked the City administration to rededicate the Blaisdell as a War Memorial and erect new plaques. The good news is that the rededication ceremony of Blaisdell is scheduled for 5 pm, Tuesday, November 10, 2015, on the Blaisdell Center lawn between the Concert Hall and Ward Avenue. Nā-Huihui-O-Makaliʻi, “Cluster of Little Eyes” (Makaliʻi) (a faint group of blue-white stars) marks the shoulder of the Taurus (Bull) constellation. Though small and dipper-shaped, it is not the Little Dipper. But it is not these seven sisters that is the subject of this summary; this story is about Mellie, Kulamanu, May, Einei, Lucy, Kathleen and Lani – the seven daughters of Curtis and Victoria Ward. The Wards bought land on what was then the outskirts of Honolulu, eventually acquiring over 100-acres of land running from Thomas Square on King Street down to the ocean. They built the “Old Plantation” in 1882, a stately, Southern-style home on the mauka portion of the property. It featured an artesian well, vegetable and flower gardens, a large pond stocked with fish, and extensive pasturage for horses and cattle. Self-sufficient as a working farm, Old Plantation was surrounded by a vast coconut grove. That year, Curtis Ward died (at age 53,) leaving Victoria to raise seven daughters and manage the estate. Here’s a little bit about the girls. Mary Elizabeth “Mellie” Ward (February 16, 1867 to July 26, 1956) – married Frank Hustace September 30, 1886; Frank worked with, then succeeded his father-in-law in the draying business. May Augusta Ward (May 10, 1871 to January 6, 1938) – married Ernest Hay Wodehouse in 1893; he was a prominent figure in the business world of Hawaiʻi; former president of Hawaiian Sugar Planters’ Association and the Sugar Factors Co, Ltd.
Keakealani Perry “Lani” Ward (May 27, 1881, December 31, 1961) – married Robert Booth; in 1966, Kapiʻolani Medical Center for Women and Children completed a new four-story Lani Ward Booth wing on Punahou Street. Three sisters, Lucy Kathleen and Kulamanu, took control of the Victoria Ward Estate, with Kathleen becoming president and Lucy the secretary. All was not always happy in the family. Later (1957,) the Supreme Court decided on sisters Lani and Mellie (and nephew Cenric Wodehouse) petition for the appointment of a guardian for their sister, Kathleen, alleging that Kathleen was seventy-seven years of age, mentally infirm and unable to manage her business affairs. The Blaisdell Center has been in operation since 1964 and in 1994 was remodeled and expanded. The Blaisdell Center complex includes a multi-purpose Arena, Exhibition Hall, Galleria, Concert Hall, meeting rooms and parking structure. The image shows Mellie, Kulamanu, May, Einei, Lucy, Kathleen and Lani – seven sisters, and daughters of Curtis and Victoria Ward. In addition, I have added other related images in a folder of like name in the Photos section on my Facebook and Google+ pages. Curtis Ward was born in Kentucky and arrived in Hawaiʻi in 1853, when whaling in the Pacific was at its peak. 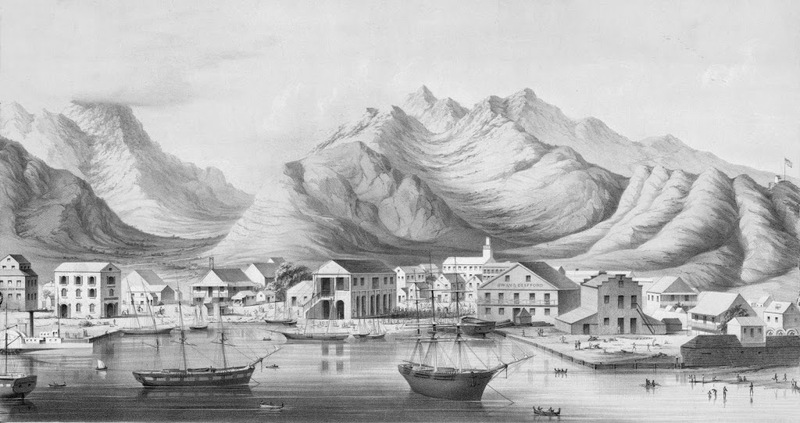 Curtis worked at the Royal Custom House, which monitored commercial activity at Honolulu Harbor for the kingdom. Victoria Robinson was born in Nu’uanu in 1846, the daughter of English shipbuilder, James Robinson and his wife Rebecca, a woman of Hawaiian ancestry whose chiefly lineage had roots in Kaʻū, Hilo and Honokowai, Maui. Seven daughters were born during these years: Mary Elizabeth, Kulamanu, May, Einei, Lucy, Kathleen and Lani. 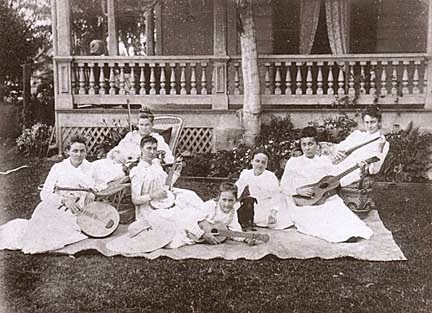 As was common for many young married couples of English and Hawaiian ancestry during this period, the Wards socialized comfortably with Honolulu’s expatriate British families, as well as with members of the various Royal families. 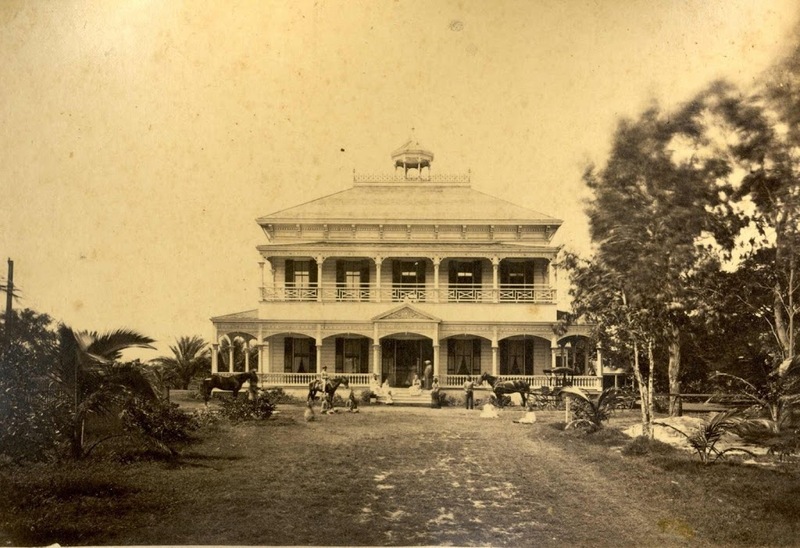 Then, the Wards bought land on what was then the outskirts of Honolulu, eventually acquiring over 100-acres of land running from Thomas Square on King Street down to the ocean. In 1882, Curtis Ward died at age 53, leaving Victoria to raise seven daughters and manage the estate. Old Plantation became one of the showplaces of Honolulu and remained substantially unchanged for nearly 80 years. In 2002, Chicago-based General Growth Properties Inc (owner of Ala Moana Center) closed on an agreement to buy Victoria Ward Ltd., giving it control of one of the state’s largest private landowners and operator of a growing retail complex in Kakaʻako. The image shows Old Plantation. In addition I have added other images related to the property in a folder of like name in the Photos section on my Facebook and Google+ pages.